Riche Body Butter and Hand Butter from Pre de Provence | P.C. Fallon Co.
Moisturize and soothe your skin with fabulously fragrant Riche Body Butter and Hand Butter. Created with a trio of naturally replenishing butters, Riche Body Butter and Hand Butter contains Organic Shea Butter, Organic Cocoa Butter and Mango Butter. 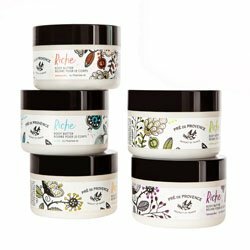 Like all Pre de Provence products, Riche Butters are made in France and fragranced with unmistakably French scents including Amande, Lavender, Starflower and White Gardenia.